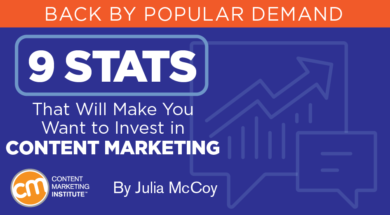 Editor’s note: Because proving the value of content marketing continues to be necessary, Julia McCoy updated her 2016 post with some fresh stats and perspective. Content marketing has been moving at the speed of light in recent years. Consumers are fed up with in-your-face advertising and sales tactics that feel cheap, slimy, or underhanded. Instead, they’re attracted to authenticity, transparency, and friendliness in a brand. The advent of the internet and social media has a lot to do with this. These channels help consumers pick and choose exactly which brands they interact with. If people don’t want to see your ads, they’ll click away – it’s as simple as that. 1. Pit content marketing against paid search, and content marketing gets three times the leads per dollar spent. HANDPICKED RELATED CONTENT: Ads Are Killing the Web: Are You Part of the Problem? Want more stats to support your content marketing strategy (or to inform potential improvements), check out CMI’s latest research. Subscribe today and be alerted when the 2018 B2C content marketing research is released later this year.